Every year since 2004 when they launched, the MEMES institutes have continued to grow and change. The latest additions to the curriculum are music in the digital age and social media. This year, a record 80 students enrolled. On Saturday, 80 students wrapped up six weeks of real-world projects and classes led by a group of seasoned industry executives in the business of media, entertainment, social media and sports. That’s record attendance for UCLA Anderson School of Management's annual MEMES Summer Institutes that have been growing in popularity. The institutes, offered by Anderson’s Center for Management of Enterprise in Media, Entertainment and Sports (MEMES) since 2004, introduce primarily undergraduates to careers in entertainment, music and sports. Among those who enrolled this summer were many UCLA students as well as participants from Sweden, France, Italy, Canada, China and Brazil — not to mention a recent Harvard graduate who wants to jump-start her career on the business side of entertainment. Students also choose one of four tracks: Blockbusters: the business of movies and TV; Music industry in the digital age; Sports marketing and management; or 360° marketing for entertainment and media. Potter said that the sports focus is the most popular, taught by Mark Francis, a sports marketing specialist with significant expertise in brand management. “The 2015 sports business program was the biggest and best yet,” Francis said. “We had 34 outstanding students from around the world who proved to be terrific ambassadors for our program during their respective research projects.” He attributes the institutes’ success in part to stellar guest speakers. Los Angeles Clippers general manager David Wohl, longtime Dodgers GM Ned Colletti, NFL Players Association executive director DeMaurice Smith and sports “super agent” Leigh Steinberg were among those who spoke to students in the sports business program. In addition, students are assigned a “live project” in which they learn how business is conducted in their industry and how best to position themselves for careers. Five student groups provided insights on specific projects for major entertainment/media companies: NBC, Universal Pictures, Legendary Entertainment, the CW Network and Walt Disney Studios. “One of the highlights of this summer was attending ESPN’s ESPY Awards, where our students saw the media, entertainment and sports sectors converge,” said MEMES executive director Karen Williams. MEMES students took field trips to YouTube Studios, ad agency 72 and Sunny, Fresh Juice Global, Creative Artists Agency (CAA), Paramount and Warner Bros. studios, and Dodger Stadium. Other guest speakers included Kendra Johnson, a vice president at Maker Studios; UCLA Athletics director Dan Guerrero; Disney Studios CFO Paul Shurgot; and executives from Sony, NBC and Huffington Post, among many others. Warren Baker earned his B.S. in business management at Babson College in 2003 and now runs the Paris offices of alternative investment group Global Emerging Markets. Baker participated in the institutes on the Blockbusters track. 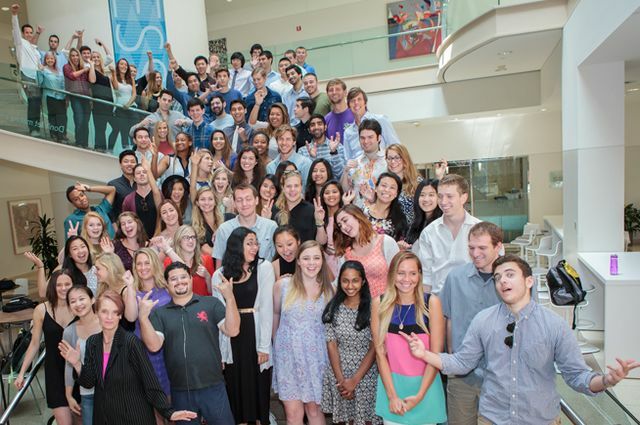 The future appears bright for these summer graduates — and for the program too. 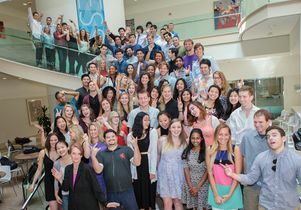 On the last day, a group of enthusiastic students was headed to CAA to pitch a marketing plan around a CAA client brand. 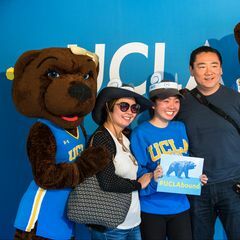 This story is posted on the UCLA Anderson blog.